Richard Mason (14, Royal Lymington) was the outstanding performer of the Volvo Musto Optimist Inland Championship at Datchet Water Sailing Club near Slough over the weekend (18-19 May). Datchet Water Sailing Club hosted 273 young single-handed sailors with a 50-boat regatta fleet for younger, less-experienced sailors, while the main armada of Optimists was brimming with some of Great Britain’s most promising young racers. The 223 main fleet sailors were divided into four approximately equal sized groups for the heats so each group raced each other. The main fleet sailed three races each day in favourable conditions of a Force 5-4 on Saturday and Force 2-3 on Sunday. Recently selected as one of five sailors to represent Great Britain this year at the Optimist World Championship in Texas in July, Richard secured the title of Volvo Musto Optimist Inland Champion winning three of the six races and posting two seconds and a fourth. This impressive score line gave him a one point lead over world championship team-mate Tom Mallindine (14, British Steel). Tom is an old hand at the worlds – 2002 is the fourth year he has been selected. Richard’s father Chris Mason is one of Great Britain’s top yachtsman and is currently a sailing member of GBR Challenge, the first British entry into the Americas Cup since 1987, and was on hand on Sunday to watch the racing and present the prizes. Third placed Edward Powys (14), from Restronguet Sailing Club, home club of gold medallist and former winner of this event, Ben Ainslie, was also one of the favourites for the event having been selected for the Optimist European Championships in Portugal in July. Powys finished five points off second and was only one point ahead of Hannah Mills (14), Bowmoor, who was second in the World Championship selection series and subsequently the first British girl to qualify for this event since 1997. Fifth placed Andrew Conn (14), from Derwent Reservoir, will also race at the Optimist Worlds. The first junior prize (under 13 years) went to Iain McKeeman (12) from Bowmoor Sailing Club, who finished eighth overall. In 11th, Claire Lasko (12), also from Bowmoor and selected for the European Championship Team was the first junior girl. After adverse weather conditions meant that only one race was completed at this event and the Volvo Musto End of Season event in 2001, there was great relief all round that six races were sailed over the two days. 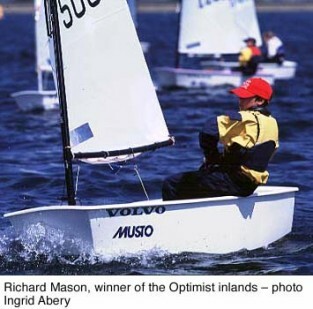 These events, along with the Volvo Musto National Championship form the basis of the Optimist National Rankings.